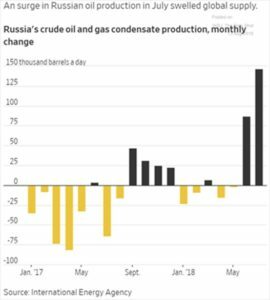 held minor gains as major producers increased or maintained production while geopolitical tensions stayed relatively subdued. OPEC crude production rose in August to the highest level this year as a recovery in Libyan output helped to offset a cut in Iranian exports due to US sanctions. The cartel collectively produced 32.7 million barrels per day (mbpd) in August, up 0.4 mbpd from July. Libya was the largest contributor to the rise, increasing by almost 50% to 1 mbpd. Iran experienced the largest drop in production of 0.2 mbpd, to 3.5 mbpd as sanctions bit into exports even though they do not take effect until November. Chinese buyers of Iranian oil are starting to shift their cargoes to vessels owned by National Iranian Tanker Co. to avoid sanction impacts with state oil trader Zhuhai Zhenrong and refiner Sinopec leading the way. 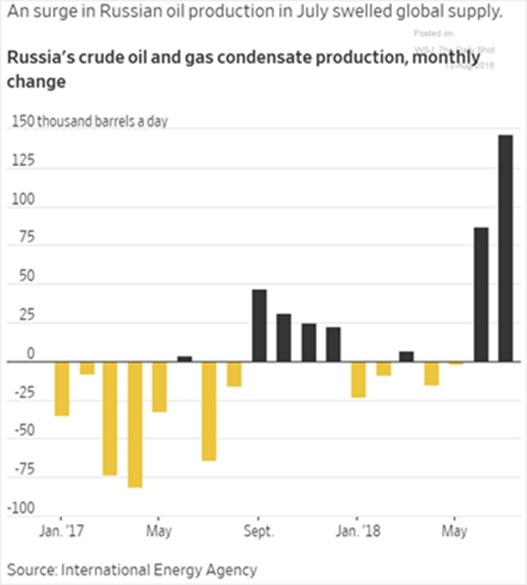 Russia kept pumping at near post-Soviet records last month, producing an average of 11.2 mbpd in August, little changed from July’s push higher (see right graph of the monthly production changes through end of July). Shipments of West African crude to Asia were set to reach a record high in August, driven by a surge in demand from Indian refiners, who will take more oil from the region than at any time since mid-2015. According to Reuters, 890,000 bpd will sail to India, compared with 600,000 bpd in July and almost double last August’s 460,000 bpd. In OPEC politics, Saudi Arabia shelved its Aramco IPO plans and instead borrowed $11 billion via its sovereign wealth fund. While the IPO may be resurrected next year, we will consider any chatter about it a mirage until then. Venezuela went through a series of grinding setbacks in August, highlighted by its currency losing 95% of its value, lopping off five zeros from the bolivar. The new bolivars are supposedly tied to their “crypto” petro but there is nothing really behind that currency either. There were some offsetting pronouncements (e.g., an increase to the minimum wage, price controls, cutting of many gasoline subsidies) but with annual inflation at 80,000%, the reforms are so far not substantial enough. Foreign public debt is still unpayable at 600% of GDP, the highest in the world. To no surprise, Venezuela’s government missed a principal payment on one of its bonds for the first time this week, boosting arrears on international securities to $6.1 billion (previous non-payments were only for interest payments, per Bloomberg). After having various oil assets seized in the Caribbean, PDVSA agreed to pay $2 billion to ConocoPhilips as awarded back in April. With less than $10 billion in foreign currency reserves, Venezuela attempted to avoid payment but was dependent on the seized assets to process its crude oil, its basic source of government revenue and graft. We are also still waiting for confirmation that the payment was actually made. Separately, Canadian gold miner Crystallex won a $1.2 billion arbitration award versus Venezuela after the country nationalized its gold mine for no compensation. The US court allowed Crystallex to take over Venezuela’s CITGO assets, but at the last minute PDVSA posted a bond postponing that award until an appeal is held. Other bondholders have laid claim to PDVSA’s assets (essentially CITGO) but with little success. Finally, to try to revive production, PDVSA announced an agreement to increase production by 640,000 bpd at 14 oil fields, valuing the investment at $430 million, but only named seven of the fourteen private signatories (five of which are Venezuelan, one is Panamanian and one Chinese). Who actually is participating in the deal, besides the Venezuelan kickbacks and a Chinese equipment supplier? stayed flat in July at 10.9 mbpd overall (see graph next page) and rig count moved up to 862 rigs on August 31st from 861 rigs on July 27th. Hurricane season kicked off with Gordon causing producers in the Gulf of Mexico to shut in 157,000 bpd of oil and 232 MM cu. ft. of natural gas production, but the storm was weak and production quickly restored. 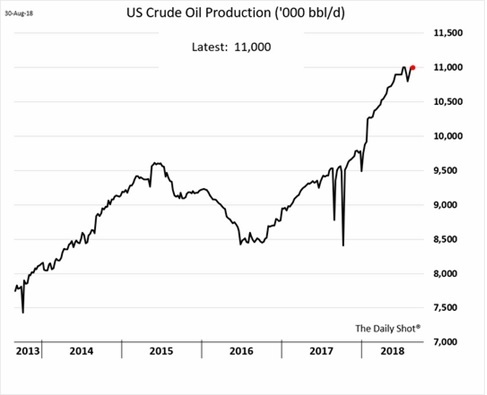 Oil production from the seven major shale basins is expected to rise 93,000 bpd in September to 7.5 million bpd, per the U.S. Energy Information Administration (EIA). Oil output is expected to rise from all these major shale formations, except for the Haynesville shale, the smallest, in which output is expected to remain unchanged at 43,000 bpd. Current estimates of profitability break even at $35 to $40 per barrel, well below the $65 to $70 per barrel seen in the futures markets (ignoring transportation discounts). A federal judge in Montana ordered the US State Department to do an additional environmental review of a revised route for the Keystone XL oil pipeline, possibly delaying its construction. 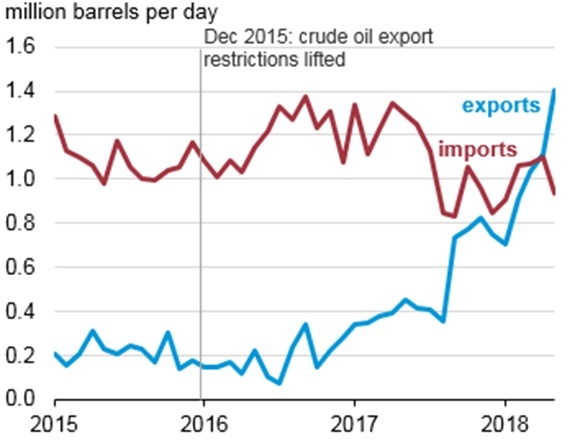 S. crude oil exports eased slightly to 2.1 million bpd in July (estimated) from a record 2.2 million bpd in June, with foreign trade data showed with China halting US exports over trade war fears. Chinese exports were expected to be zero in August with US shipments only to South Korea, Japan and India. Finally, the port district of Houston-Galveston became a net exporter of crude oil in April for the first time on record (see left graph from the EIA), marking an important changeover in the OPEC era. seemed to recover as independent refiners, known as “teapots”, resumed purchases. Crude shipments came in at 8.5 mbpd, up from 8.2 million bpd a year ago. However, as the Chinese government stopped publishing the relevant import data for the fifth month in a row in August, these figures should be considered estimates. Oil consultant Platt’s reported that overall Chinese imports of crude oil rose slightly in August from July as refiners come out of maintenance and some restocking of crude supplies occurred ahead of ramping up of refinery runs. Chinese oil refinery output rose 11.6% in July from a year earlier, with state-run plants operating at high rates but smaller independent refiners struggling with squeezed profit margins. Refinery throughput reached 11.95 million bpd per government figures. An interesting observation was that an Iranian tanker discharged its cargo at the Myanmar oil terminal in August, indicating that state-run PetroChina is increasingly using the pipeline through the Southeast Asian country for importing Iranian crude to its refinery in southern China, perhaps skirting sanctions. US exports of liquefied natural gas (LNG) to China in July fell to their lowest level in a year and are expected to decline further as the Sino-U.S. trade dispute forces utilities to seek alternative supplies. 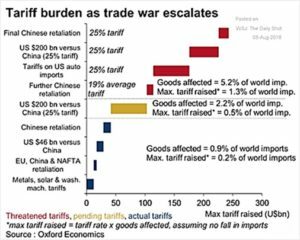 stepped up a notch as $200 billion more in tariffs will likely come into effect in September. More talks are just rumors at this time. 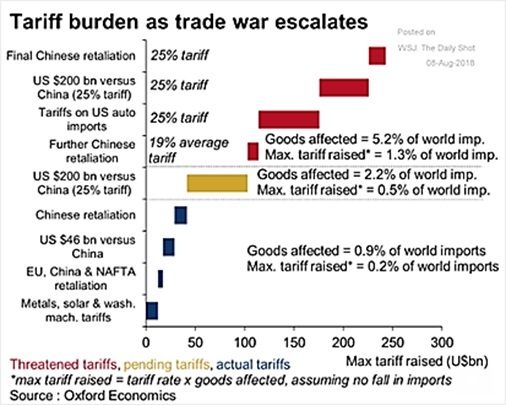 However, the overall US trade deficit widened to $50.1 billion in July, and the deficit with China widening to a fresh high of $36.8 billion. Seasonally, imports from China increase into the US holidays in December so do not be surprised to see this deficit increase further. Tougher steps against Iran will come into force on November 5th, when the U.S. looks to cut off Iran’s oil exports and imposes sanctions on Iran’s shipping, among other measures. Cotton trade with Turkey is under pressure as the collapse in the Lira has Turkish buyers backing out of contracts. Political conflict with the US over a prisoner held by the Turks complicates the situation. Argentina is expected to produce a record crop of wheat and corn during the 2018-19 season as farmers planted more hectares of both than in previous years, with the wheat harvest potentially reaching 21 million tonnes (more than 10% higher than the prior season). On the other hand, EU soft wheat production forecast was seen 10% below last year due to drought damage. Germany’s overall grain harvest has been so badly affected by a lingering drought that Europe’s second-biggest grains grower is poised to become a net importer for the first time in more than three decades. Brazil is likely to expand its soybean planting to a record 36.3 million hectares (89.7 million acres) this season, which farmers will start planting around September, a +3.2% expansion. They are encouraged by strong demand from China. Big crops expected here in the US as the government forecasted soybean production in 2018-19 would rise to an all-time high of 4.6 billion bushels, up from 4.4 billion bushels a year earlier and more than analysts expected. Chinese demand for soy may falter as cases of African Swine Flu spread – instances are still relatively few but the disease is quite virulent (though fortunately not transmittable to humans). Soy demand from the US is expected to fall -9.5% due to the trade conflict and the swine flu.